When I was diagnosed with stage three non-Hodgkin’s lymphoma in 2007, I Googled “parenting with cancer.” I was trying to figure out how to navigate my children, then ages 10 and 8, through the harrowing summer (and fall) ahead with my cancer treatments — six rounds of chemotherapy and five weeks of radiation. I found a few good links and books, but no one comprehensive place for parents to find the information and “I’ve been there, too” stories I was looking for. I swore that if I made it to remission, I would change that. 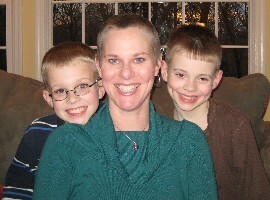 ParentingWithCancer.com will grow to be the site I was looking for when my hair was falling out and my kids were being ferried around by friends and family. It’s the place where moms and dads can go to find out how to tell their children the words they never thought they’d have to say, “I have cancer.” It’s about the emotions you’ll deal with (yours and your kids’), the treatments you may face and the changes you will have to make. Here, we’ll create a starting point for the best resources and information that parents with cancer and the people who love them need. We’ll also include “been there” stories from moms and dads who have faced cancer, and a space for you to share your stories and thoughts. Meanwhile, know that you are not alone, and that you can parent with cancer. These days, I’m in remission, and my kids are in middle school. We made it through the treatments and the aftermath, and now I can create the web site I looked for when I was a parent with cancer. My name is Melissa Thompson. I am an oncology social worker. I am also a blogger whose blog focuses on how to provide support to those impacted by the cancer/oncology experience – both professionally and personally. I’d love to write about you in my blog and your new endeavor. I have been working with others who have founded support organizations to get some information on what moved them to do their work. Would you be open to that? My blog is called the OncWorker if you’d like to look it over. I would be honored to share your story and your mission. Very happy to come across your website. My mother and sister are also cancer survivors. Wish you good health and success in this great resource. I also just started a child development resource website and this is a great resource I will be adding! So glad you’re doing this, Jen! I came across you a few years ago online. I’m not sure exactly where it was, but I do recall name, your story of survival…and your oh-so-humorous writing. I’m sure it was some website you had about your writing where I connected with you. And now, I am connected through @411Voices. As a Child & Family Therapist and past medical social worker, I have worked with countless families who have been through the uncharted waters of a cancer diagnosis and have been honored to work with many through their journeys. My focus has been helping kids cope and helping parents help their kids cope. Like Melissa, above, I would love to have you do a brief piece for my blog, or a brief Q&A for my blog, so that I can share this fab resource with my readers, as well as with other families I am connected with through social media. What you are doing will change lives. There is no question. Thanks for being a voice for families trying to find their way through. I imagine you propping them up and supporting them through as they seek safe passage to the other side. I love your site as much as your speech at the ASJA Conference. You are truly an inspiration, an entertaining one. For me, as a fellow cancer survivor, you have inspired me to move forward with my blog about my own experiences. I enjoyed speaking with you at ASJA and hope to meet up with you again soon, maybe you have a book tour through my area soon. thank you for your kind words that day. I am so impressed with your website. I am an RN who started looking for a resource for family members who are parenting their young family while dealing with a serious illness. Your website provides practical advice and support for parents coping with this difficult life experience. Your website acknowledges that serious illness affects the whole person…not just their body. This is something that is often forgotten or not dealt well in the middle of medical crisis. Taking care of the family is always a huge underlying worry of parents who become sick. The information presented in a way that is user-friendly, honest and upbeat. It is a great resource for people who want ideas about these challenging issues for their children, spouses and extended families. Thank you for sharing your views and opening up this forum to the world. I will definitely share it with my friends and colleagues. I commend you for your web site and the wonderful service you provide. For parents: Helping Your Children Cope with Your Cancer, by Hatherleigh Press, and highly recommended. And for the children: Talking with my Treehouse Friends About Cancer. Our friends at Bristol-Myers Squibb purchased 100,000 copies of this book, and distribute them free to cancer centers for their patients. I have a clinic where I help cancer survivors to restore and optimize their health after cancer. I frequently recommend your site to parents and am so grateful for all your amazing work! Thank-you for all your tremendous efforts and please visit my website at http://www.survivorshippartners.com and don’t hesitate to contact me if there are any ways that we can collaborate! if you can join us in the fight. Or tell us if we are at least on the right track as we are brand new to this but we would Love to help as it has affected so many lives. I’m always glad to find a website that actually offers quality content and value. I’m an attorney and I run mynannycontract.com. I am reaching out to gauge your interest in a possible collaboration. Would you be interested in publishing an article written by me on your site? As a licensed attorney with a focus in contract writing, I am capable of writing accurate,articulate, and interesting articles on the subject of hiring a nanny and the possible problems people often face. I can enlighten new parents on potential traps and answer questions I’ve been asked a million times. My style may not surpass that of a professional writer’s but I try to include wit and maintain a certain flow to keep visitors reading through to the end. As a parent myself, I have a passion for this subject which actually inspired me to start my business in the first place. My goal is mutually beneficial community building and idea sharing. It is through these methods I’ve seen immense improvements in traffic, followers, and search rank for my own website. By keeping the visitors in mind and providing them with the information they need to make knowledgeable decisions, you can’t go wrong. If you’re interested, send me a message and we can discuss this potentially exciting affiliation together. When my husband was diagnosed with cancer, our three daughters were all under the age of 7. As a mother, my goal was to protect them and refrain from talking about it in front of them. Even if I had wanted to talk with them about it, I would have had no idea how. What I learned later is that they were asking their grandparents “is Daddy going to die?” Not talking to them and explaining it to them made them more fearful. I published a book that was inspired by my experience with my children. I struggled at my attempt to protect them and take away their fear. The book is designed to help others succeed in talking and explaining cancer to a child in a way that they will understand without frightening them. This is a tool that can be utilized not only to start the conversation but to help encourage sharing between the child and the adult. It is available on Amazon and can be ordered on our website. If you feel this would be helpful I would love to send you a copy. Thanks for having the courage to turn your cancer journey into a way to help others! Leave a Reply to Melissa Thompson Click here to cancel reply.